Safe-Uses super-thin blade and smooth pivoting head,to trims safely on sensitive skin without irritatio,to smoothly trace the contours of your skin to closely and comfortably to shaving,perfect touch,impeccable. 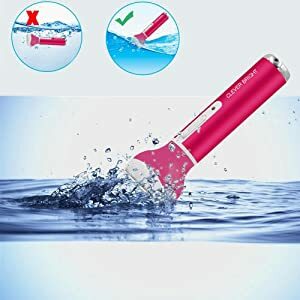 4 in 1 Multiple Head Multifunction Hair Shaver - Uses four independently floating heads:Body Shaver,Eyebrow Shaper,Nose Trimmer,Facial Beard and Bikini Privates Razor. 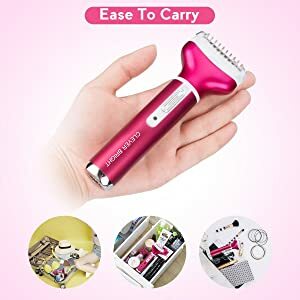 Painless and Flawless - Body Shaver,Eyebrow Shaper,Nose Trimmer,Facial and Bikini Privates Razor have high speed trimming engine with upgraded sharper blade saves your time on hair removal by ceffective let you own perfect touch,impeccable. Waterproof Technology- Wet and dry dual use,makes it possible for you to use it When bathing. (But please don't dip it in water). Simple Unique Exterior Design - Fashion and simple design mini shaver has portable handle is easy to carry anywhere in anytime. Your new mainland. Do you find it? --- Painless & flawless 4 in 1 hair removal, it suit all skin. 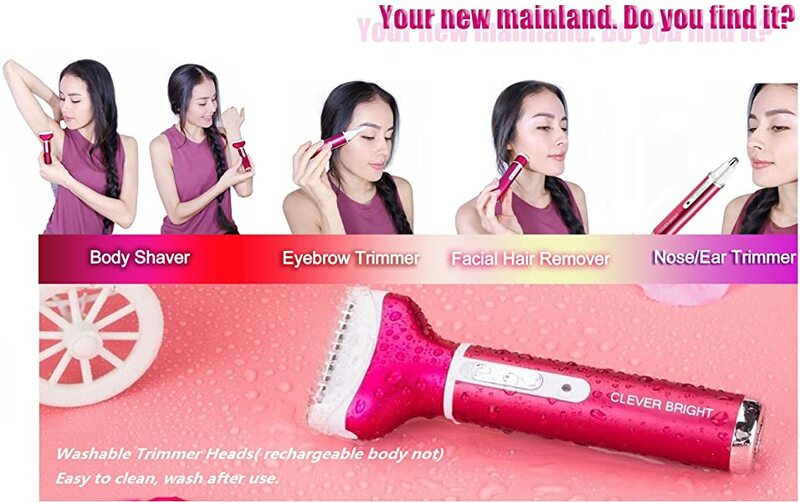 4 in 1 hair removal has 4 shaver heads:Body/legs/armpit hair shaver(has mount on the shaver body), eyebrow shape trimmer, nose & ear hair trimmer, facial/bikini trimmer(the round head). Is portable for you to anywhere. 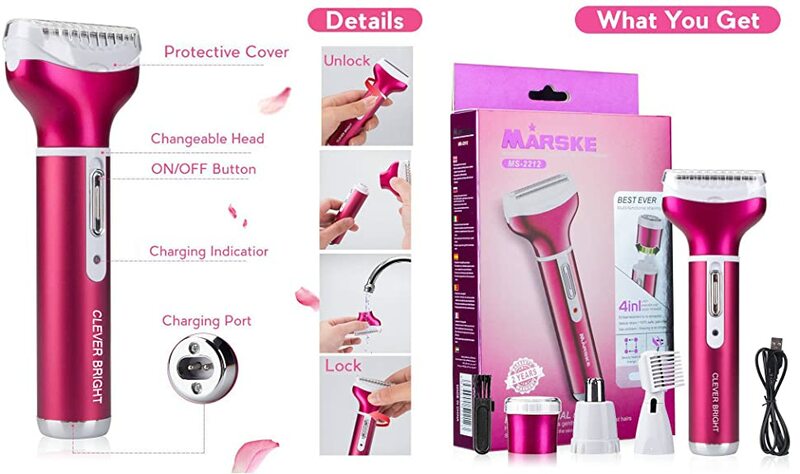 CLEVER BRIGHT Professional Painless Ladies Hair Removal Set is applicable for each lady even gentleman. There is barely nothing that a 4 in 1 hair removal set can not deal with, either long medium texture coarse hair or short soft hair. By applying different shaving heads, it removes the hair gently off the skin without pulling or tugging, giving you painless shaving experience each day. What makes the CLEVER BRIGHT Painless & Flawless 4-in-1 Hair Remover stand out from? High quality and seiko secret agents, let CLEVER BRIGHT stand out from. It's a best gift for ladies and the best to gift your lovers. Suitable for women of all ages. The trimmer for women lets you shave, trim and transform your bikini area, whilst the conditioning strips help your skin to look and feel fantastic. Portable and handy kit, a Must-Have device for home & travel. The nose hair trimmer can be used for men and women, small, compact, and can be carried easily in your pocket, purse, briefcase, bag or anywhere else and also perfect for travel. Ergonomic Grip Handle makes it convenient and easy to handle. Washable Trimmer Heads( rechargeable body not) Easy to clean, wash after use. IPX5 waterproof, you just need to clean the 4 shaver heads, it is easy to clean and can save much time for you. 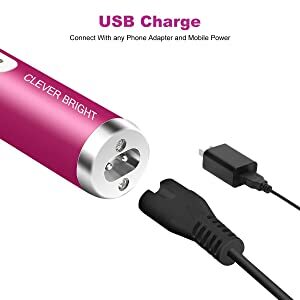 USB Charging: Nose hair trimmer rechargeable design with USB port, can be charged by laptop, power bank, etc., energy saving and lightweight, much covenient for travel or carry around. There Is One Built-in Rechargeable Battery in the Device. More Powerful and Portable than Normal Battery. For Beard, leg hair, arms and armpit hair, neck, bikini line and other body area those sturdy hairs, you should use two sides of the body shaver to trim first, then use its middle to shave, and finally use the round shaver do a carefully trim. If your hair is short，fine and soft, you just use the body shaver or round shaver.